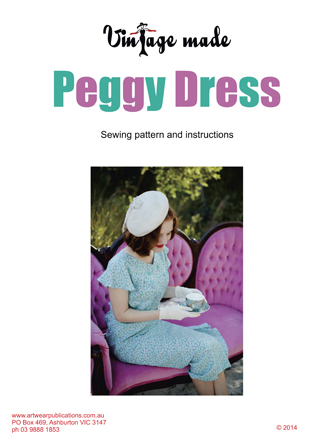 The Peggy Dress Pattern was the pull-out pattern in Vintage Made issue 3. We have a limited number of paper patterns available for you, conveniently bundled in to a plastic sleeve with the instructions. The Peggy Dress is sized according to your bust measurement. We have chosen to increase the sizes in 5cm (2″) increments, and display the sizing in inches, as true vintage patterns always featured their measurements in inches. Notions: 6 x 2.5cm (1″) feature buttons; 1 x small button for back neck edge fastening, plus loop to fit button; small quantity lightweight interfacing; pins; tailors chalk; thread. Suitable Fabrics: 3m (3.3yds) of 115-120cm (45-47″) wide, softly draping fabric, such as crepe de chine, faille or georgette, for the first three sizes (add 50cm per size for the last two sizes). Allow extra fabric to match stripes or plaids. We used cotton poplin in the pictured dress.